Results from tests on genetic material from alleged remains of one of the mythical half-ape and half-human creatures, made public at a news conference on Friday held after the claimed discovery swept the Internet, failed to prove its existence. 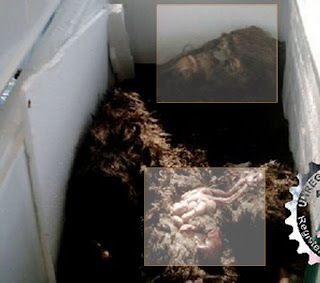 One of the two samples of DNA said to prove the existence of the Bigfoot came from a human and the other was 96 percent from an opossum, according to Curt Nelson, a scientist at the University of Minnesota who performed the DNA analysis. Bigfoot creatures are said to live in the forests of the U.S. Pacific Northwest. An opossum is a marsupial about the size of a house cat. 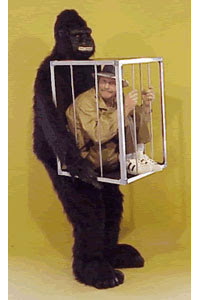 Results of the DNA tests were revealed in an e-mail from Nelson and distributed at the Palo Alto, California, news conference held by Tom Biscardi, host of a weekly online radio show about the Bigfoot. Also present were Matthew Whitton and Rick Dyer, the two who say they discovered the Bigfoot corpse while hiking in the woods of northern Georgia. They also are co-owners of a company that offers Bigfoot merchandise. Despite the dubious photo and the commercial interests of the alleged discoverers, the Bigfoot claim drew interest from Australia to Europe and even The New York Times. Biscardi said the DNA samples may not have been taken correctly and may have been contaminated, and that he would proceed with an autopsy of the alleged Bigfoot remains, currently in a freezer at an undisclosed location. 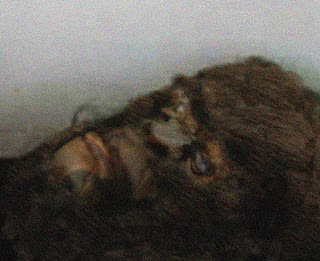 Here at BfRLC Labs we have taken the photo of the captured Georgia Gorilla, varied the midtones, shifted the contrast, and even reduce the noise to see if we could somehow gain more detail from the photo of the alleged Bigfoot corpse. This is the most we could get out of the head and face. There does not seem to be much skull or teeth support under the skin. The face almost flattens sideways. However we were able to reveal the texture of the eyesockets and actually get more definition to the snout. For reference you can see the two areas of interest where we decided to focus on, hoping to reveal any tell-tell clues. 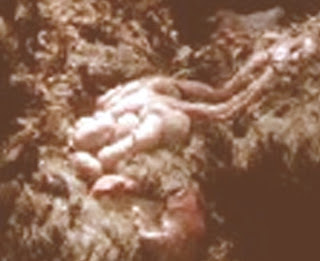 Not as clean as we had hoped but a close up of the entrails does suggest they may have originated from a smaller animal. Even if we are seeing a partial intestine, the sudden tapering at any end can help estimate the length and size of an intestine. this one seems to taper too suddenly for a 500 pound animal. Over all the jury at BfRLC is still out. We are anxious to hear what will be revealed Friday. As the first website to post the captured bigfoot last month we will contiue to keep you up to date with the latest and most up to date Bigfoot news anywhere.